2014 was a good year for the stock market, with the S&P 500 returning 13.8%. 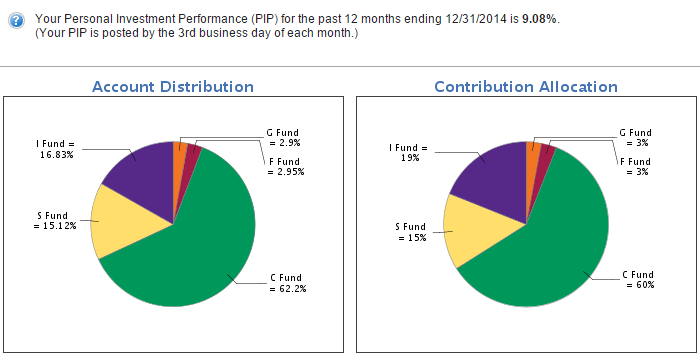 My 2014 balanced portfolio gave me a 10.41% return, as calculated automatically and instantly by Personal Capital. While I didn't beat the S&P 500, I maintained the stock and bond ratio that I'm comfortable with. I rebalanced my accounts once in May 2014 to bring them in line with my asset allocation plan. I didn't have to rebalance again during the year, because none of the funds grew or shrank more than 5% outside of the percentages I've determined. This was the first year I was able to max my contribution to my Roth TSP ($17,446, $54 under the max for 2014) and both my wife's and my Roth IRAs ($5500 each, $11,000 total). For the TSP, I contributed $1458 per month automatically from myPay. For the Roth IRA, Vanguard offers a “maximize my contribution” feature that automatically calculates how much you need to contribute each pay period to maximize by the end of the year. The feature worked great and we contributed exactly the max for 2014. We were also able to keep our SDP fully funded for most of the year. This gave us a guaranteed 10% return and instant access to $10,000, which is always an amazing investment to have in the portfolio. Here's the Vanguard funds I invest in. I don't have all Admiral Shares ($10,000+) yet because the funds are in separate Roth IRA and taxable investment accounts. We'll probably get them all to Admiral level by 2016. I don't follow the daily or even monthly movements of the market. As you can see, sometimes you'll lose $1000 in a month and sometimes you'll gain $1500. You'll drive yourself crazy and start second guessing your asset allocation strategy if you are checking market movements every day. I keep track of my total investment returns across all my accounts in Personal Capital. It also lets me track my total net worth including my home value, other investments I've made (private equity, SDP, CDs), and my debts as well. As you can see in the graph to the right, PC aggregates your total investment performance across all your accounts in the “You Index.” This allows you to quickly compare your performance against a variety of indices. For 2015 I plan to maximize my Roth IRA ($11000, $5500 each for my wife and me) and Roth TSP ($18,000) contributions once again. This should be $29,000. As an O-3, to maximize my TSP contribution should be about 29% of my base pay. For maxing the IRA I'll rely on Vanguard's “Maximize my Contribution” feature. We currently have $10,000 in the SDP and I'll try to hit a combat zone at least once every 90 days to keep that 10% gravy train flowing. If the money does drop out, I'll reallocate it towards debt repayment. I'm going to knock out as much of my $23,000 remaining student loan as I can this year and have it paid off of by the end of 2016. As for my asset allocation, I'll update that in May 2015, but it shouldn't be much different than what I had this year. Maybe a bit more in bonds as I move closer to my 75%/25% stock/bond permanent financial independence asset allocation. Maximize your tax advantaged accounts. Every year that you don't contribute the maximum to your 401k, TSP, or IRA is one less year you have to contribute! When you don't maximize you are leaving tax advantaged investments on the table. If you're military and not contributing to the Roth TSP, you're missing out on an opportunity for a lifetime of tax free investments. Pay down your debt. Free up monthly cash flow and allow yourself to contribute more to your investments. If you have debt above 3%, you need to pay that down ASAP! Anything less than that pay down soon but just think of what you could do with the extra money every month when the debt is cleared. I know I'm sick of my college loan debt hanging around my neck for the past 5 years. Time to get rid of it this year! If you have high interest credit card debt, look at refinancing it with a Prosper Loan at a much lower rate. Keep track of your progress in Personal Capital. 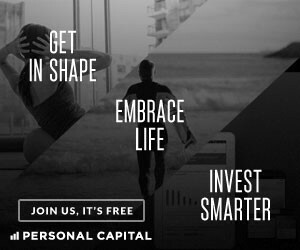 Personal Capital is the best free online tool I've found to keep track of your net worth. It allows you to track the Zestimate from Zillow.com for your home, all of your investment and savings accounts, your debts, and your cash flow. Instantaneously see your asset allocation, investment performance, and run a free portfolio check-up tool to make sure you're not overpaying or too risky. Read my full review here. Make some extra cash on the side. There are always money making opportunities out there. Some are smarter than others. The best thing we've done to make extra money is rent our place out on AirBnB when I'm deployed and my wife is with family. It's covered almost half our mortgage for the last two years. What are your plans for 2015? After you max your Roth TSP/401k ($18,000 in 2015) and Roth IRA ($5500 each for 2015), where are you investing your money? How are you going to make 2015 a more prosperous year? Jason – thanks for the detailed comment! Let’s definitely compare results at the end of 2015. I have a feeling your returns will be less extreme than mine, because of your 20% bond allocation. I’m only doing 8% in May into my F and G fund. I’m very excited to eliminate my debt ASAP. Just freeing up the extra cash flow to invest every month is going to be amazing. I’m almost 30…time for student loans to go! I haven’t started dabbling too much into Vegas money stocks. This year with oil hitting $50/barrel I decided to pick up UWTI, GST, RIG, and BNO for $1000 total. So far I’m down 38%, so obviously not doing very well with that. Oh well, that’s why it’s Vegas money right? I’m on the same trackline as you for 2015, with maxing out my Roth IRA and TSP contributions. Let’s compare 2015 performance next year, it’ll be interesting to see how things play out. With a rebalance in May. 64/16/20 U.S. Stocks/Intl Stocks/U.S. Bonds allocation. Do you dabble with any, what I call “Vegas money,” individual stocks? This will be my first year maxing out my tax-advantaged accounts – paid off my debts last year so it was nice to have that burden lifted, you’ll find out soon enough! Best of luck with the 2015 goals and keep up the fight!